Veterinary medicine focuses on animal health and the study of diseases that affect all animal species. 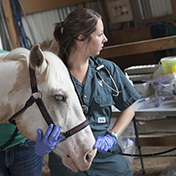 Veterinarians receive comprehensive training in all basic and clinical sciences with relation to a variety of species, including food‑producing animals, horses, companion animals, exotic pets and wildlife. Four-year degree. This doesn't include the two years of university-level studies that you are required before you can apply. This program prepares you to meet the needs of animal health care in Western Canada and beyond. Our curriculum allows you to pursue personal interest areas including small, large or exotic animal care, surgery, medical imaging, anesthesiology, pathology, wildlife medicine, or animal-human health-related issues — just to name a few. You will gain hands-on experience with animals through formal laboratory exercises, elective courses and fourth-year rotations. You will also receive instruction in leadership, communication and practice management to prepare you for your future professional careers. You will focus on basic and applied science core courses. Your integrated, co-ordinated introduction allows you to learn all aspects of one particular system or body region before moving on to the next area. You will gain more in‑depth, focused learning including hands-on experience in particular areas of interest through a range of core/elective courses. You will gain clinical experience during the program's final year, completing a series of two- or four-week clinical rotations. Students can also arrange for externships at specialty practices, zoos and aquariums in other provinces or countries. The college's Veterinary Medical Centre is Western Canada's centre for primary and specialized clinical services, as well as for veterinary teaching and animal health research. The WCVM Veterinary Medical Centre's diverse caseload ensures that veterinary students are exposed to a range of animal species and health issues during their senior years. One of the finest introductory research initiatives in North America, first- and second-year students have the opportunity to work alongside experienced researchers at the college, learning more about the world of research and gaining valuable, hands-on experience. Veterinarians make ideal leaders of One Health, a global initiative for improving animal, human and environmental health through collaboration among all of the health sciences. That is especially true at uSask — the only Canadian university with a full complement of health science colleges and schools on one campus. Veterinarians play a critical role in agriculture and production animal health, and the WCVM is well placed to educate new veterinarians in food animal medicine. 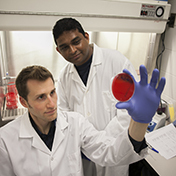 uSask's College of Agriculture and Bioresources and the WCVM also collaborate on many food animal research studies that contribute to the students' training. 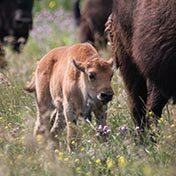 All WCVM students learn stress-free livestock handling at this 840-hectare farm that is home to more than 250 head of beef cattle, deer and bison. Mixed animal practitioners treat large and small animals while large animal practitioners focus on agricultural livestock. Small animal veterinarians provide health care for dogs, cats and exotic pets. Some private practitioners specialize in treating individual species such as dairy and beef cattle, swine, horses or companion animals. Clinicians with advanced training provide specialized services in many clinical disciplines including surgery, internal medicine, medical imaging, anesthesiology, ophthalmology, veterinary pathology, dentistry, wildlife medicine and oncology. Provincial and federal veterinarians help to develop public policy and legislation related to animal and animal human health. They regulate the import and export of livestock and food products. They are responsible for the control of infectious diseases among livestock and wildlife from a local to global level. They provide diagnostic services and ensure the health and safety of commercial meat products. 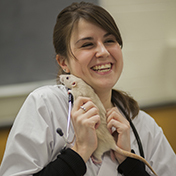 Veterinarians are involved in teaching and studying animal health at veterinary colleges, universities and research institutions. Veterinarians also contribute to advances in human medicine and collaborate with researchers around the world. Veterinarians take part in the research and commercial development of new feed products, drugs and technologies with animal health companies. WCVM students can write the North American Veterinary Licensing Examination (NAVLE) without any restrictions. The NAVLE is a comprehensive test written by all U.S. and Canadian veterinary students in their final year. WCVM graduates are eligible to practise in all provinces of Canada, in all American states and in several other countries. The college is also recognized by the Royal College of Veterinary Surgeons. This means WCVM graduates are eligible for membership in the RCVS, allowing them to practise in the United Kingdom and any country recognizing RCVS membership. For further information about the WCVM’s accreditation, visit the WCVM website. Tuition estimates reflect a typical amount you could expect to pay per year (2018-2019 Canadian dollar rates). * Prices subject to change and will vary from student to student and year to year. Students should consult with the institution they plan to attend for further information about high school prerequisites for pre-veterinary courses. Read through the Admission Requirements below to see what is needed to be considered for admission. In addition to completing the required pre-veterinary courses, applicants should work toward an undergraduate degree since the majority of students have completed three to four years of university before gaining admission at the WCVM. This will provide you with alternative career choices if veterinary medicine is no longer an option. General counselling may be received by contacting the WCVM Admissions Office. Prospective applicants may contact the pre-veterinary advisor at their respective university for advising within their local context. 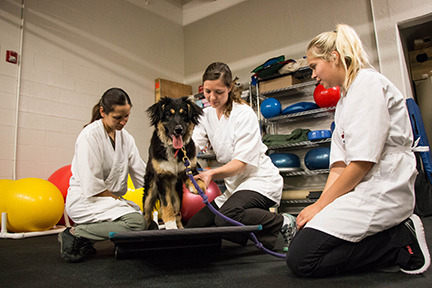 Students have organized pre-veterinary clubs at a number of universities across Western Canada. If you're interested in learning more about the Doctor of Veterinary Medicine (DVM) program and enjoy meeting other students who have similar interests, these student-run organizations offer a range of opportunities including tours, wet labs, guest speakers and resource materials. If you're an undergraduate student from Western Canada, you're also welcome to join the WCVM's Pre-veterinary Students' Facebook page where current veterinary students are available to answer questions about the WCVM and its DVM program. The WCVM Veterinary Medical Centre offers volunteer opportunities to students interested in the Doctor of Veterinary Medicine degree program at the WCVM. The admission information below provides a cursory review. Please ensure you've read the entire WCVM Applicant Manual before applying for admission to the program. The guide contains the official admission policies. All applicants must be Canadian citizens or permanent residents of Canada. Residents of foreign countries are not eligible to be considered for admission to the WCVM. * The Government of Alberta is not renewing its participation in the WCVM interprovincial agreement after 2020. Fall 2019 will be the last year of provincially-funded Alberta seats. ** Applicants with service to the Government of Canada (a member of the Canadian Forces, an RCMP officer or another similar role) who do not meet the criteria for residency under the rules described below may be considered through the Other/Territories designated seat. Service considered may pertain to the applicant, their parent or spouse. Applicants should contact the WCVM Admissions Office to determine eligibility. In the case of an applicant who has not established his or her own residence and lived in that residence for 12 continuous months (excluding any time enrolled as a post-secondary student in or outside of that province), the WCVM will consider the applicant’s residence to be the province or territory of Canada where his or her parent(s) have lived most recently for 12 continuous months before the WCVM’s December 1 application deadline. In the case of an applicant who has established his or her own residence in a province or territory in Canada, the WCVM will consider the individual’s residence to be the Canadian province or territory where the applicant lived most recently for 12 continuous months before the WCVM’s December 1 application deadline. This 12-month period excludes any time enrolled as a post-secondary student in or outside of that province. In the case of an applicant who has established his or her own residence outside Canada and intends to re-establish residence in this country, the WCVM will consider the applicant’s residence to be the Canadian province or territory where he or she lived most recently for 12 continuous months before leaving Canada. This 12-month period excludes any time enrolled as a post-secondary student in or outside of that province. In the case of an applicant who is a Permanent Resident of Canada (as defined in Canada’s Immigration and Refugee Protection Act), the WCVM will consider the applicant’s residence to be the province or territory where he or she first resided in Canada under two conditions: the applicant has established his or her own residence in a Canadian province or territory but has not yet accumulated 12 continuous months without post-secondary study, and the applicant’s parent(s) do not reside in Canada. In the case of an applicant who is from the Northern territories, residency is defined by their own rules because the Yukon, Nunavut and Northwest Territories are not formal signatories of the college's interprovincial funding contract. Indigenous Equity Access Program: Each year, two seats are available for Indigenous students through the Education Equity Program. Applicants must be residents of the four western Canadian provinces or the northern territories. At least two full years of university courses are required to complete the requirements. Most applicants have more than two years of university. However, neither the number of years of pre-professional study nor the degree(s) held are factors in selecting students. Electives: There are no "preferred" electives. The choice of electives should be based upon the requirements of the program in which the student is enrolled or the student's general interests. Students are encouraged to select electives that will liberalize or broaden their perspective. 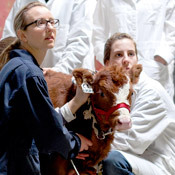 Pre-veterinary courses completed at the U of S are usually met in the College of Arts and Sciences or the College of Agriculture and Bioresources. Pre-veterinary courses not completed at the U of S may be taken at any accredited college or university. Non-residents of Saskatchewan will not improve their chances of admission by attending the U of S for pre-veterinary coursework. Courses taken as part of vocational programs — such as animal health or veterinary technology programs — are not usually accepted to meet the college's pre-veterinary course requirements. However, a few courses in some programs may be used if the applicant has completed the vocational program. Each case is considered on its individual merit. A minimum, cumulative average of 75 per cent is needed to be considered for admission. All grades are converted to a common scale for comparative purposes and this converted average will be used. Applicants are required to have both experience and good knowledge of animals and the veterinary profession to be successful in gaining admission. The diversity, quality, depth and breadth of animal and veterinary experiences are assessed in the interview. The importance of animal and veterinary experience is to ensure applicants “know what they are getting into” and are making an informed career choice. Experiences should be obtained under the supervision of a veterinarian in placements such as clinical practice, research laboratories, animal shelters, animal rehabilitation facilities, public health settings or another related industry where a veterinarian is employed. Veterinary experience provides applicants insight into the day-to-day life as a veterinarian and an understanding of the veterinary profession. The purpose of the experience is not to learn a basic core of veterinary or animal handling skills. For many, obtaining veterinary experience means spending quality time with a veterinarian — either as a volunteer or as a paid employee. Significant animal experience is required because it's assumed that most veterinarians will be working with animals during their career. Experiences working with animals allows applicants to determine how well they enjoy working with animals. These experiences also help to give an indication of their aptitude and compassion. "Significant animal experience" goes beyond pet ownership. For example, it could include responsibility for the care and husbandry of livestock or a food animal unit, breeding/showing animals, experience at rehabilitation facilities or humane societies/shelters, working in a pet store, participating in equestrian activities, or any other animal-related hobby or experience where a veterinarian is not always present. Applicants' experiences are often consistent with their career goals. However, it's important to understand the diversity of the veterinary profession since both the DVM curriculum and the veterinary licensing examination require proficiency in a broad range of areas for successful completion. For this reason, it is strongly advised that applicants gain experience working with a variety of species such as cows, horses, pigs, chickens, fish, exotics, wildlife, dogs and cats. The WCVM admissions committee recognizes that applicants' career goals in the veterinary profession may change over the course of their education. During the admissions process, there are no "preferred" career choices. Applicants with an interest in one type of practice are not given preferential treatment over those with interests in other areas. The amount of animal and veterinary experience will vary from one applicant to another because some individuals are more perceptive than others and some experiences might be more useful than others. Some applicants will be able to obtain these insights after minimal exposure while other applicants may need more time and exposure. Each year, the Western College of Veterinary Medicine admits up to 78 students to its first-year class. Since there are usually about 400 applications every year, completion of the pre-veterinary requirements does not guarantee admission to the WCVM. Degrees or diplomas held are not factors in the selection process. Mental aptitude and academic performance are mainly evaluated by academic transcripts. All university work undertaken is considered when evaluating academic performance. The courseload of the applicant is a consideration. Applicants who have not taken a full courseload could be at a disadvantage when evaluating academic performance. The structured interview is designed to assess the applicant's ability to cope with the veterinary program and to evaluate non-academic qualities. Referees' evaluations and overall documentation are also used to assess these non-academic qualities. Applicants attending out-of-province interviews will be charged a $150 fee. Applicants are required to nominate two referees to support their WCVM application. One referee must be a veterinarian while the other must be an individual who has an animal-related or agricultural background. Space is provided on the application form to list referees name and email address. Referees will be contacted directly and asked to complete the reference form online. View a sample reference form. The deadline to apply online for the Western College of Veterinary Medicine's Doctor of Veterinary Medicine program is December 1. Before submitting your application, please review the essential skills and abilities (see below) required for the study of veterinary medicine. 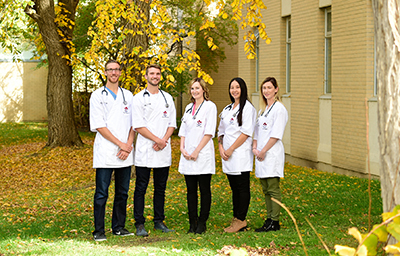 The Western College of Veterinary Medicine at the University of Saskatchewan is responsible to society to provide a program of study that produces graduates with the knowledge, skills and aptitudes necessary to practise veterinary medicine. Graduates are expected to diagnose and manage health conditions in a wide variety of animal species. Graduates must provide compassionate care to animals and be able to communicate clearly with owners, regulatory agencies and others. Graduates must also meet licensing requirements and pass licensing examinations. Applicants to the degree program in veterinary medicine should be familiar with the essential skills and abilities required for the study of veterinary medicine. Candidates for the DVM degree must demonstrate a number of essential skills and abilities. 1. Observation: The student must be able to participate in learning situations that require observational skills. In particular, students must be able to observe animals and acquire visual, auditory and tactile information from their examinations. 2. Communication: Students must be able to acquire an adequate history from an owner. Students must be able to hear and observe their animal patients in order to effectively collect information and describe the findings. 3. 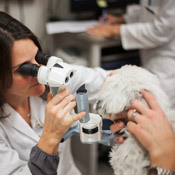 Motor skills: The student must demonstrate sufficient motor function to be able to perform a physical examination on an animal that may include palpation, auscultation, percussion and diagnostic procedures including examination with an ophthalmoscope, otoscope or stethoscope on large and small animals. Students must be reasonably able to execute motor movements to achieve general proficiency with surgical therapy and other related therapies. 4. Intellectual conceptual, integrative and quantitative abilities: The student must demonstrate the cognitive skills and memory necessary to measure, calculate, analyze, integrate and synthesize information. In addition, the student must be able to comprehend dimensional and spatial relationships. There are diagnostic, problem-solving activities commonly encountered during the DVM program that will need to be executed in a timely fashion. 5. Non-technical attributes: Veterinary students must consistently demonstrate non-technical skills, knowledge and aptitudes that allow them to interact with clients, collect histories, apply sound judgment and complete responsibilities in the diagnosis and treatment of animals. Students must be able to develop effective relationships with owners, staff and colleagues. This policy exists to ensure students entering the DVM program are aware of the requirements necessary for the study of veterinary medicine, and that they have a reasonable opportunity to complete the program and earn a DVM degree. The Western College of Veterinary Medicine is committed to facilitating the integration of students with disabilities into this college community. Each student with a disability is entitled to reasonable accommodation that will assist him or her to meet the requirements for graduation from the college. Reasonable accommodation will be made to facilitate each student's progress. Such accommodation, however, can not compromise animal well-being or the safety of the people involved. Therefore, it may not be possible to accommodate all disabilities and allow for successful completion of the Doctor of Veterinary Medicine degree program. Contact our Access and Equity Services office for additional information regarding support. Privacy is defined as the protection of the collection, storage, destruction and dissemination of personal information. Personal information on your application is collected for the purpose of evaluating your admissions application and producing statistical reports. By providing information on this web site, you are consenting to the use of the information collected as described below. Your decision to withhold particular details may limit the services we are able to provide. If you prefer not to provide information through the web site, please contact our office by email (wcvm.admissions@usask.ca) or call 306-966-7459. When you submit your application online, you will be required to pay online via credit card. The University of Saskatchewan will not disclose information other than that identified above unless authorized by you, or when it is required or permitted by law. The type of information that we are legally required to disclose may relate to criminal investigations or government tax reporting requirements. In some instances such as legal proceeding or court order, we may also be required to disclose certain information to authorities. Only the information specifically requested is disclosed and we take precautions to satisfy ourselves that the authorities making the request have legitimate grounds to do so. There are some situations where we are legally permitted to disclose personal information such as employing reasonable and legal methods to collect a delinquent account or to investigate suspicion of illegal activities. Credit card information is validated by Moneris Solutions, a service company of the Royal Bank of Canada and the Bank of Montreal. The University of Saskatchewan has taken several measures to ensure the confidentiality and security of your personal information. We use several layers of robust security methods including SSL technology, encryption, firewalls and timed log-outs to ensure the confidentiality of your personal and financial information. SSL (secure socket layer technology) is the industry standard tool for protecting and maintaining security over the internet. To ensure that your connection is secure, look for a "closed lock" or an "unbroken key" icon located at the bottom right-hand side of your browser's task bar, a yellow background in the browser location bar or other indication specific to your preferred web browsing software. Digital certificates verify the identity of the web site and organization you are accessing to protect you from counterfeit sites. Timed log-outs mean that sessions are terminated after a period of inactivity just in case you forget to log out or leave a computer unattended during an online session. When you are finished conducting online transactions or visiting secure web sites, remember to properly log off and close your browser. This will ensure that any information stored on your computer or in your browser is erased — preventing others from being able to view this information later. Many internet browsers will automatically complete forms by remembering previously typed-in information. This means your credit card information could be stored in memory long after you have left our merchant site. If you are using a computer that is publicly accessible — such as an internet café or public library — please be aware that your personal information may be at risk. Customer information is retained for the period of time required to fulfil the purpose for which it was collected. Credit card information is validated by Moneris Solutions, a service company of the Royal Bank of Canada and the Bank of Montreal. The University takes reasonable precautions to protect the personal information collected from loss, misuse, unauthorized access, disclosure, alteration and destruction. Financial information provided (credit card details) is stored in encrypted text and is available only to authorized users. If you believe that there has been a breach of security of this site, please contact the Western College of Veterinary Medicine's Admissions Office (tel: 306-966-7459). Your electronic payment transaction will be completed once credit card authorization has been received. Payments will be charged to your credit card by Moneris Solutions (our credit card processor) and typically processed within seven business days. If you require further information, please contact the Western College of Veterinary Medicine's Admissions Office (tel: 306-966-7459). You can contact the University of Saskatchewan to change or update information you have provided by calling the WCVM Admissions Office (306-966-7459). The WCVM Admissions Office is open each business day from 8:30 a.m. to 4:30 p.m. (CST). If you have complaints about the privacy or security of this web site, please contact the WCVM webmaster. Official transcripts should be sent at the time of application unless applicants are currently enrolled in university courses. In such cases, current year transcripts are required immediately upon grades being reported in both January and May for the September-December and January-April terms, respectively. University of Saskatchewan transcripts will be accessed directly (not required from registrar). When the application and supporting documents have been received and evaluated, the WCVM Admissions Office will contact applicants who will be interviewed to inform them of the time and place of the interview. Note: Two applicants are interviewed for each first-year seat (for example, 40 applicants will be interviewed for the 20 allotted B.C. seats). The weighting of selection factors to determine the rank order of acceptance is 60 per cent academic and 40 per cent non-academic. Final selections for admission are made after interviewing is completed. The process is usually completed before July 1. The four-year Doctor of Veterinary Medicine (DVM) is offered by the University of Saskatchewan's Western College of Veterinary Medicine (WCVM). Established in 1963, the WCVM is the premier centre of veterinary education, research and clinical expertise. It serves as the regional veterinary college for Canada’s four western provinces and the northern territories. As one of Canada’s five veterinary colleges, the WCVM is a key member of Canada’s veterinary, public health and food safety networks. If you are looking for graduate level (master's or PhD) programs please consult our graduate students' website.